“I’m sorry, did you just say you’re going to…Hyderabad? !” Our plan to spend the end of the year in the Nizami city was met with a mixture of surprise, scoff, pity, and confusion from our friends, further dampening our already low spirits on zeroing in on this city. Bemoaning our terrible holiday choices, we braced for long traffic jams and boring city “things to do.” So much so that we stayed in our hotel the first two days (a school boy error in hindsight) binging on Christmas specials, stepping out only to experience the city’s claim to fame – Hyderabad Biriyani. The chef (always be nice to chefs!) at our hotel, recommended the popular restaurant chain. A massive collage of cricketers, politicians and actors greeted us at the entrance – a proud display of their past patrons. Packed to the brim at 9pm, we were seated in a dingy corner of the 1500 cover restaurant. Despite a dodgy tummy and exhaustion, we tucked into the steaming rice served with mirchi ka salan and raitha with enthusiasm, tempted to take some back for a secret hotel room midnight snack! The art history student in me was mildly excited at the thought of visiting Islamic tombs. But the moment we drove into the complex, I turned to mush in sheer awe of their scale. The Qutb Shahi complex houses tombs of seven of the dynasty’s rulers, alongside relatives, their favourite physicians, and court performers. Walking around the unkempt Ibrahim Bagh gardens felt like going back in time to the age that saw a remarkable blend of Hindu, Persian and Pashtun (Afghan and Pakistani) architectural elements. Lofty minarets, bulbous domes, remnants of glazed tiles, stucco work, magnificent arches, and engraved calligraphy on raised sarcophagi adorn the sprawling necropolis. The tallest mausoleum stands at 42.5 meters, topped by a massive dome. Glazed tile remains on the tombs – how they must have shone in their day! Inside one of the tombs – sadly neglected, but will soon get a facelift! Each of the structures has short hidden passages in all four corners, that let you go through one entrance and come out another, presumably to stock items of prayer. At the moment, they are filled with rubble and dead plants. Also furnishing these over 400 year old walls are modern declarations of love etched into the plaster with black soot, complete with hearts, phone numbers and dates. Why we find the need to leave a mark of our presence at historic sites is perplexing. Surely something we’re proud of and want association with ought to be treated with the utmost veneration. I love you, you love me, but nobody loves these walls enough to leave them alone! It’s the perfect time to visit and witness the stark transformation the restoration efforts are breathing into the structures. But while these are getting rid of the chipped plaster, vegetation, vandalism and graffiti, one wonders if barricading surfaces would be a good consideration to contain visitors’ innate desire to destroy things of beauty. For a people deeply defensive of their heritage, our collective respect for its tangible elements seems bland at best. A restored tomb in all its glory! Yet another testament to the region’s rich history, the Golconda Fort presents ruins that have weathered over hundreds of years. As throngs of people propelled us through the gates, children clapped ceaselessly to send echoing messages to their friends at the top of the fort. As we walked higher and the population understandably dwindled, a view of the vastness began to shape. A lack of signs means it is difficult to truly appreciate the planning unless you have a guide. Reading up on its history and layout is recommended to make the best of what you see! Huffing and puffing our way to the top, we passed stables, private chambers, mosques, bastions, gateways and unfortunate signs of squatting. 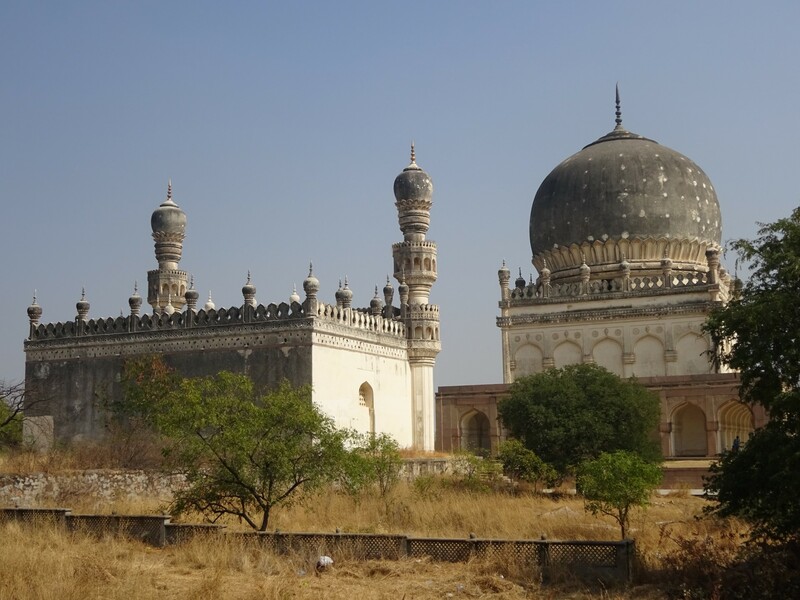 Apart from a stunning view of the fort’s design as well as the Qutb Shahi tombs 10 minutes away, the climb makes you well aware of your (lack of) fitness levels. View of ruins from the top – would have made a fantastic location for Lord of The Rings! The Arc de Triumph of the East may now be ticked off our list, but I’m not sure climbing nose to nose with at least a thousand other people was the best experience. Visitors pushed each other’s bottoms up the frighteningly narrow spiral stairway that could only accommodate one person’s girth at a time. I am pretty sure that’s where I picked up a nasty flu and spent the next week in bed! Unless you go early in the morning, I strongly recommend appreciating the tremendousness of the structure from the outside. Walk through the bazaar for a visual treat of bangles, laces and other bits and bobs. It can be overwhelming for people with claustrophobia or discomfort around large crowds, but worth the experience if you can brave it. This well preserved Nizams’ palace is situated within walking distance from the Charminar. The serene courtyard and manicured lawns flanked by arched corridors on either side lead to the extravagant Durbar. Stucco covers every inch of the ornate Khilwat Mubarak (the main ceremonial hall), where grand crystal chandeliers break visual space into elegant columns. There has been a commendable effort to preserve the palace’s legacy, with fabric, furniture, coins, crockery, antique cars and motorbikes on display. A single open door allows a peek into the drawing room of one of the palaces in its original glory – heavy tapestry, dark wood parquet flooring, antique furniture, and pure luxury. Who says there’s nothing to do in Hyderabad? This metro presents fast paced industrial development against a backdrop of history, war, victory and art. Quick tips – Uber or Ola your way through the city, visit touristy places early in the morning, watch out for heavy air pollution, and wear strong walking shoes.